Getting sick without an insurance is extremely costly. While in the past it was possible to get the insurance when one was already admitted to the hospital, nowadays the government is getting stricter. In fact, if one does not have the insurance yet and gets admitted to the hospital (even if coming from the Emergency Room), he or she might be automatically considered a private patient, and might be asked to pay for all the hospital fees, which will run into thousands of Euros after just a few days. For the above reasons, almost all training institutions in first world countries, where medical costs are high, require a health insurance from their students. Similarly, the Collegio Filippino requires that each student procure a health insurance for himself. While Bishops and Dioceses commit themselves to shoulder their Priests’ medical needs in Rome, it is the Priest’s ultimate responsibility to ensure that he is properly covered (in the same way that it is his responsibility to ensure that his board and lodging, tuition, transportation, and other fees are duly paid). In Italy, the National Health Service has a standard insurance system, the “Assicurazione Volontaria al Servizio Sanitario Nazionale”. An ID card is issued for those insured, called the “Tessera Sanitaria”. If you do not have a Tessera Sanitaria (or some other equivalent medical insurance), it will be extremely difficult to accompany you to the hospital, as the hospital might be asking for a Tessera Sanitaria and charging you a huge amount. For those who do not get a Tessera Sanitaria, you need to submit a document for the Collegio Rector to file, formally indicating, in case you need to see the doctor, who should accompany you, and where to get the money for eventual payments running in the thousands of Euros. The document should be countersigned for acceptance by the person(s) indicated to accompany you, and who has access to the funds you indicated. Print and fill up the Application form. You may follow this model. Print and fill up the form for Extracomunitari. You may follow this model. As of 2017, name of Doctor could be: Dott. Enrico Tempera (see below for other options and more details). If delegating, print and fill up the Delega form. You may follow this model. Click here for an online Bolletino Postale, which you may save as PCF and print. Alternatively, print, cut lengthwise, and fill up a blank Bolletino Postale form. This is also available from the Post Office; the form might vary a bit, but the information needed is the same, as follows (you may follow this model, though your form might only have two instead of three sections). STEP 2: Gather the following documents, and make one photocopy of each. Passport (only if you do not have a Permesso di Soggiorno yet). 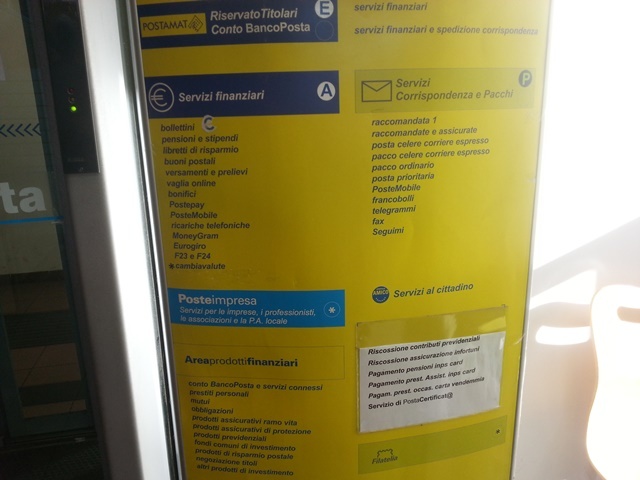 To make the payment, you (or your Delegate) may go to any post office, get a number by pressing the button for Servizi Finanziari – Bolletini (usually button letter F), and wait for your turn to be called. 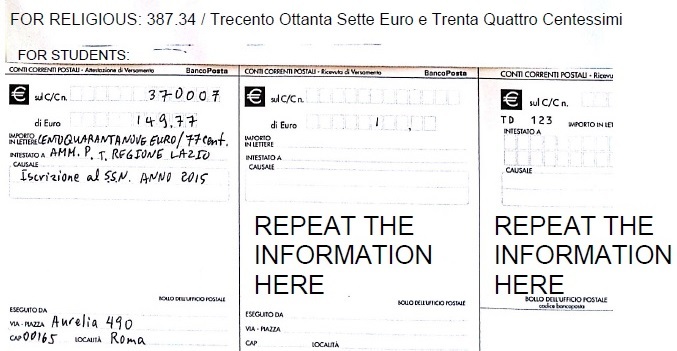 Pay the corresponding amount, plus the processing fee of around €1.50. Make two photocopies of the Poste receipt: one for the ASL, and one for your files. Bring the ORIGINALS AND PHOTOCOPIES to ASL MUNICIPIO – VIA VALLE AURELIA, 115. As of July 2017 they are open Mondays to Fridays 10:00-12:00 (even though their notice says 8:30 to 12:30; you may fall in line and get a number starting 9:00). an alternate ASL Office is at Via Boccea 271 – 00167 Roma, which is 15 minutes away walking. Dott. Enrico Tempera, at Via Lamberto Da Fagnano, 10/A – 00165 Roma, tel 06 6641 7009 (near the Carmelites); schedules: Monday 16.00-19.00, Tuesday 9.00-12.00, Wednesday 16.00-19.00, Thursday 16.00-19.00, Friday 9.00-12.00. NOTE: You may change doctors later on if you wish, by going back to the ASL office. a new “Stampa Cedolino” bond paper sheet (could be half sheet lengthwise), which indicates, among others, the name of your Doctor. Regardless of the date you apply (even if, for example, December 15), the Tessera Sanitaria fee remains the same, and the expiration will always be at most on December 31. Actually, it would expire on your Permesso di Soggiorno’s expiration date; but when you have renewed your Soggiorno, show the Poste receipts along with all the other documents stated above, so the Tessera Sanitaria can be extended for at least another six months (but never beyond December 31). You need to renew every January. Note that sometimes the card expiry is up to five or more years from the present. This does not mean that your insurance is still valid. THE VALIDITY OF YOUR INSURANCE IS INDICATED BY THE DATE ON YOUR LATEST CEDOLINO, NOT BY THE DATE ON THE CARD. The card’s later date simply means that when you renew come January, you will not be given a new card, since your old card is still useful (even though your health care insurance benefits ended last December 31). If you need to have a check up, go to the doctor you indicated. For simple complaints, this doctor will give you a prescription. Buy your medicines from any pharmacy, showing your Tessera Sanitaria and the doctor’s prescription, which entitles you to discounted prices. If your sickness requires some examinations (blood test, x-ray, ultrasound, etc.) or operation, your “medico di famiglia” will give you a prescription for the tests, and may refer you to a specialist doctor. He will inform you where you can set the appointment and have the tests done. If your situation is urgent, you will be scheduled for follow up within a few days. If your situation is not urgent, you might have to wait long for your schedule, as it means that there are others with graver illnesses than yours. In the latter case, you might have to wait weeks or even months. An alternative would be to go to a private clinic (but affiliated or “convenzionata” with the government system) to be checked earlier, at discounted prices. Emergency Room services are completely free in Italy, and do not require the Tessera Sanitaria. But the moment one is transferred to the wards for admission, one will be asked for the Tessera Sanitaria (even if the stay was initiated from the Emergency Room). If you do not have the Tessera Sanitaria, you might be considered a private patient and asked to pay for all the fees, which will run into thousands of Euros after just a few days. The Collegio Filippino will not be responsible for paying the bills. This medical insurance is valid for the whole European Union, so bring your Tessera Sanitaria if you need to go out of Italy. Switzerland is NOT a member of the European Union. Hence it is recommended that you also get an insurance when you book your plane tickets for trips outside the European Union. Check their website for updates. For the current fees, click on their link there, where it says, “contributo forfettario annuale”. The “indirect insurance” that costs around €100.00 annually covers only admitted patients, that is, hospitalized at least overnight. Out-patient visits to doctors for a check-up, and medicines and laboratory tests prescribed in such cases, are not refunded. In this system, one has to first pay for all fees, and will be reimbursed months later, after the insurance agency studies all the pertinent medical files, and ONLY IF they determine that the contract conditions have been met. A visit to the doctor for a simple check-up could cost €100 to €200, blood tests and x-rays €250, ultrasound €400, etc. This type of insurance costing €100 does not cover annual check-ups, preexisting illnesses, dental and opthalmological services, and even some diseases considered as part of normal life and ageing, such as certain heart or kidney diseases, diabetes, etc. Given the above limitations and inconveniences, and since most medical needs of Collegio Priests are visits to the doctor for check-ups rather than hospitalization, the Collegio Filippino NO LONGER RECOMMENDS OR FACILITATES any “indirect insurance” for the residents.